I love travel. It is one of my real passions. But sometimes being on the road, living out of a suitcase and endless hotel inspections takes its toll. Sometimes I need to hole up in one place, unpack once and get some R&R for a few days. When this time calls, my requirements are simple: sun sure, one flight from Manchester, a gym, spa, great food and my own space a few steps from the sea with my own sun lounger so I don’t have to get up at the crack of dawn to reserve it. You would think there were many places that would fulfill my requirements, but alas there are not, which is why I always go back to the same place. 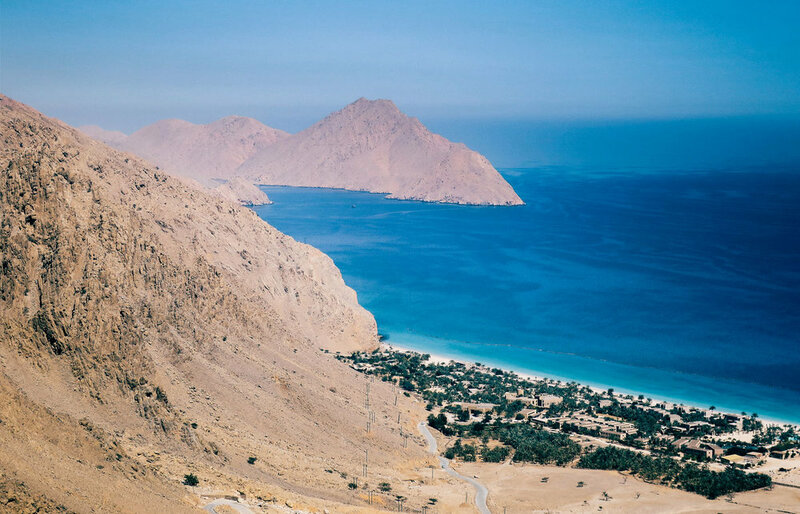 Tucked away on a secluded beach on the Musandam Peninsula, cut off from the world by the craggy Hajar Mountains you’ll find that place, Zighy Bay. 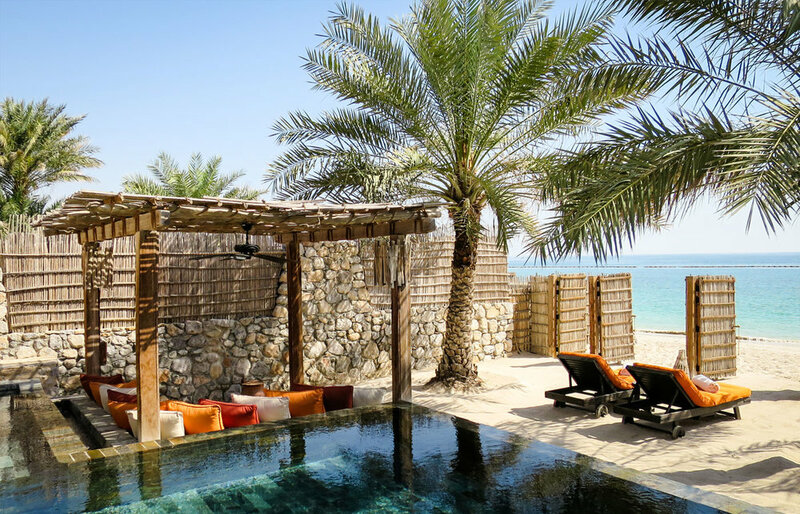 Here you'll feel a million miles away from Oman's ritzy, glitzy neighbour, Dubai, and yet it’s only a two hour drive. Arrive early morning into Dubai on the A380 from Manchester, snooze in the 4x4 vehicle sent to collect you from the airport, whizz through the Dubai / Oman border control and then have lunch in paradise. Even the arrival is spectacular. A bit of dusty off road action. Then a climb up, up, up on a winding road until the last bend when the view opens up and you finally see the resort way down below. From there you can decide to continue your journey by road or, if you’re feeling brave, you can opt to tandem paraglide down landing on the beach - surely there aren’t that many resorts where you can make such an entry? 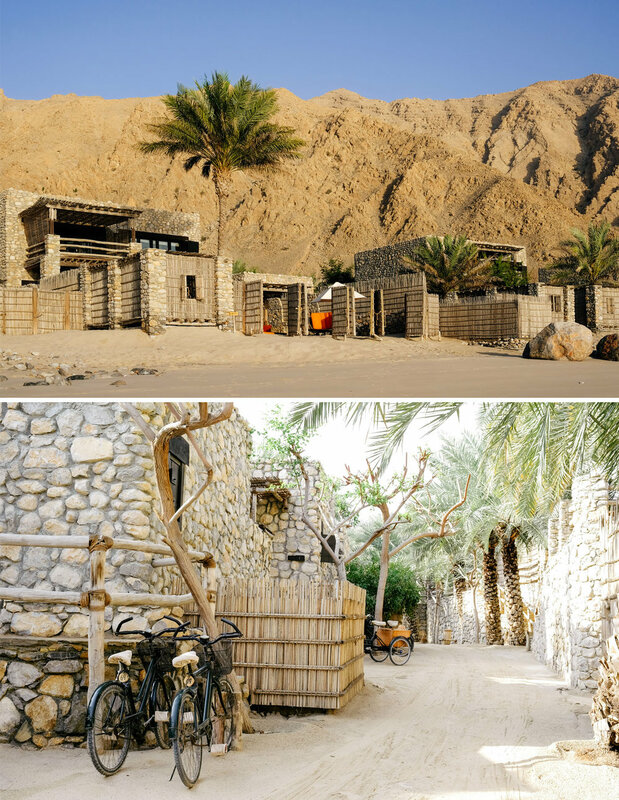 The resort is styled on a traditional Omani village, with grazing goats, fig trees and sandy lanes weaving between stone villas. 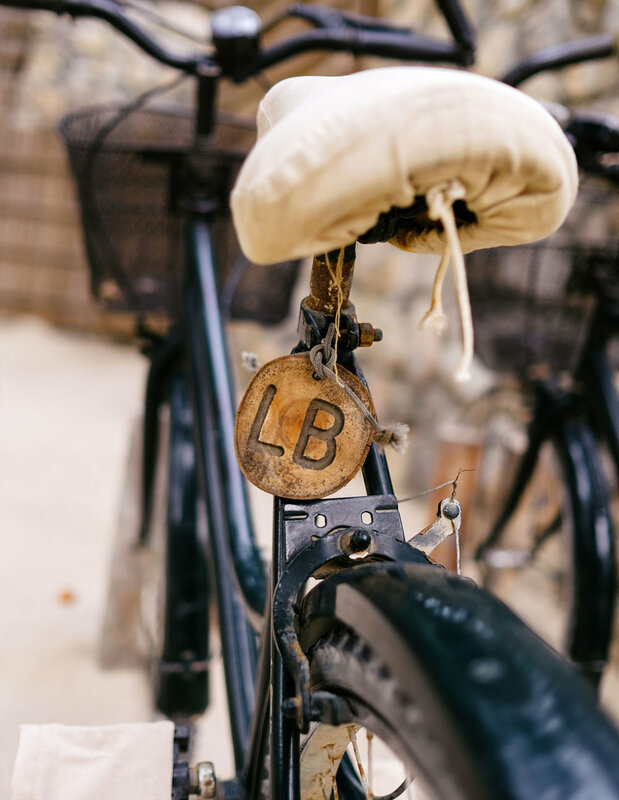 It’s rustic luxury - colourful, atmospheric and natural - with excellent service and a totally relaxed vibe. The villas are all standalone and come with your own little private outdoor world complete with infinity edged pool, sun loungers and shady outdoor majilis (seating area). Location and size vary, but my favourite are the seafront villas with uninterrupted views of the beach, ocean and amazing sunrises. There is plenty of space to move your lounger around to enjoy all day sun and there really is no need to budge except for an early morning gym session, post lunch beach walk or a swim in one of the two pools. If you don’t fancy walking between your accommodation and the restaurants, or down to the water sports centre or up to the spa, hop on your bike. Each guest gets one and if you are returnee, it is not tagged merely with your villa number, but with your initials. You even get assigned your very own GEM (Guest Entertainment Manager). 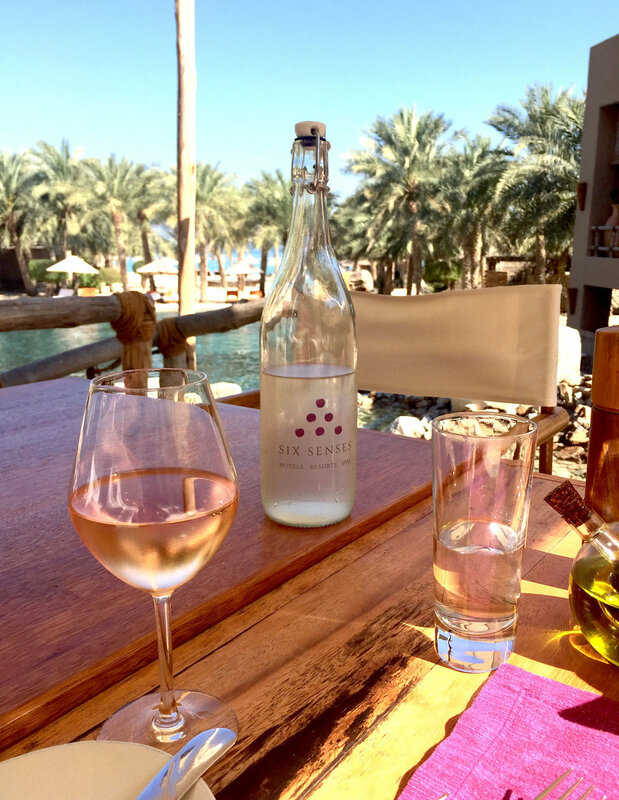 Unobtrusive but there if you need them to sort anything - candle lit dinner on the beach, challenging hiking route, sunset dhow cruise…….done. As should be the case in a resort where there are no other dining options nearby, the food is excellent and varied: lamb cooked underground for 12 hours served in the relaxed beach setting of Shua Shack; seafood at the Summer House fresh that morning; tapas with cocktails at the Zighy Bar; fine dining by flaming torches with moonlit views of the resort far below at the stunning Sense on the Edge; and something I utilise a lot, In-Villa Dining for breakfast by your pool or those nights when you just can’t be bothered to wear anything more than your bathrobe. And such service doesn’t even come with a tray charge! For me Zighy Bay is a place to switch off and relax in my own private space. But its real beauty is that you can do as much or as little as you want. There are plenty of activities to keep you occupied should you want from the gym to micro-lighting, paddle boarding, water skiing, hobeycats, snorkelling, diving, cycling or hiking. There’s also an excellent kid’s club - Zighy Bay is one of those places that fuses family friendly with romantic. Albeit I would suggest couples do not stay during school holidays. To make your stay even more relaxing, why not get me to make all the arrangements for you and that way you don't have to worry about a thing. Please do send me an email or give me a call (07734 540914), so I can tell you more about this sublime resort or discuss other holiday ideas you may have.